Interesting Patents on Polyurethane Materials and Technologies. “Gist”: Crosslinked poly(hydroxyurethanes) are prepared by reacting a cyclic carbonate comprising a carbon-carbon double bond, a di-thiol and a polyamine. Why it is interesting: According to this invention hydroxyurethanes are produced by first reacting a cyclic carbonate which has a double bond (e.g. 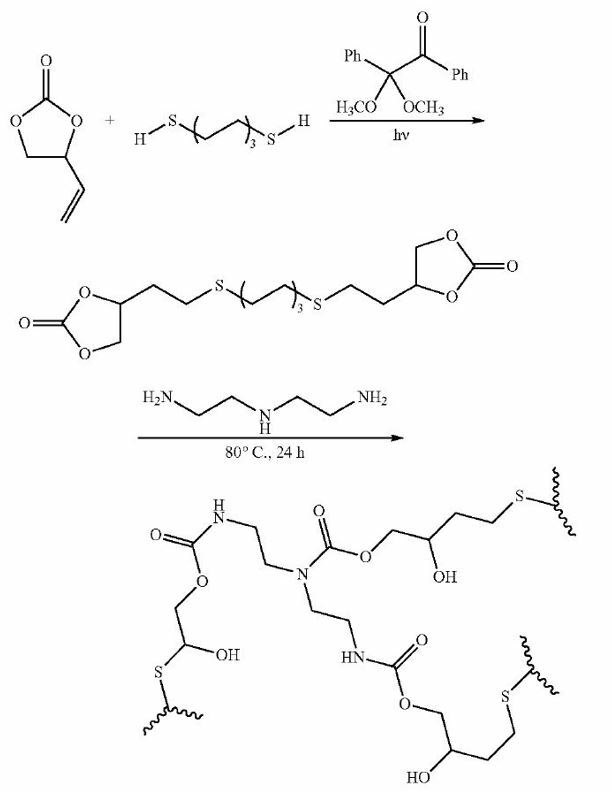 4-vinyl-1,3-dioxolan-2-one) with a dithiol (e.g. 1,6-hexanedithiol) using UV radiation and a UV initiator. The resulting di-carbonate is then reacted with a polyamine (e.g. diethylene triamine) resulting in a crosslinked poly(hydroxyurethane). Alternatively the carbonate-amine reaction can happen before the thiol-ene ‘click’ reaction. The materials can be used for binders and adhesives a.o. The reactions have the advantage of being solvent-, catalyst- and isocyanate-free and having a high yield.